Uncle Bill's Pet Centers. Cobalt CA Mysis Flakes - 5 oz. Cobalt CA Mysis Flakes - 5 oz. At Uncle Bill’s Pet Center, we not only offer Cobalt fish food for sale, we also employ a highly trained staff that can assist you in finding an appropriate formula. 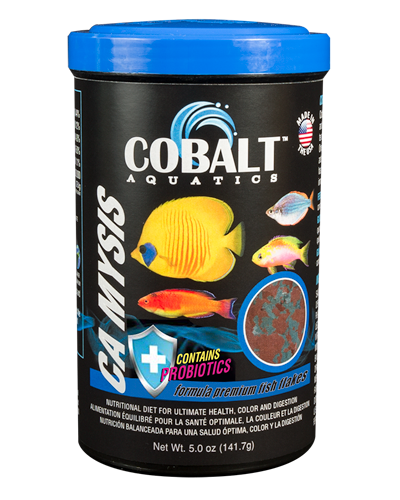 Cobalt CA Mysis flake is a Mysis based formula for all tropical and marine fish. Highly palatable formula helps both freshwater and marine finicky fish to eat prepared foods. It also features Cobalt’s BLUE Flakes that help support a healthy digestive and immune system and keep fish in top shape and color. We will be glad to work with you to ensure that you feed your fish quality food for optimal health and happiness by providing the best selection and value on premium aquarium food for sale in Indiana.